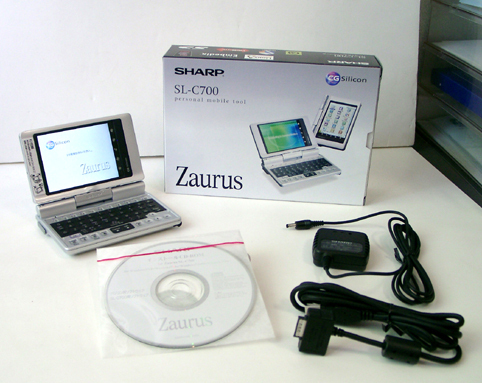 Well, at last I have Sharp Zaurus SL-C700. 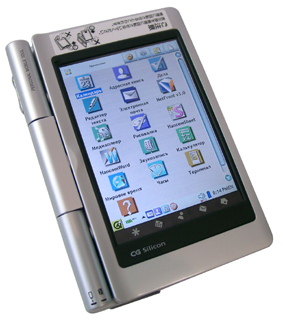 It's a novelty of the Japanese company which continues popular model line of pocket computers based on Linux. As well as earlier, the company has released an interesting and ambiguous device. The handheld computer from Sharp can compete only with Hi-End computers, and only Sony Clie NZ90 is the most close by class. 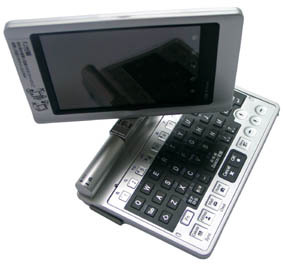 Both handheld computers have clamshell design, similar in many respects, built-in hardware keyboard and high resolution screen. But Sony has better standard kit, 2.0 Megapixel camera and Bluetooth (frequently to the prejudice of the general functionality) are at your service. Zaurus can't boast of such variety, but the price is nearly equal to Sony's. Let's try beginning the review with the most important - the packing. I liked it very much for the sizes: the box is a bit bigger than the pocket PC. There are in the box: the handheld computer, power supply adapter with cable, CD and poor user's manual. All this locates rather densely. 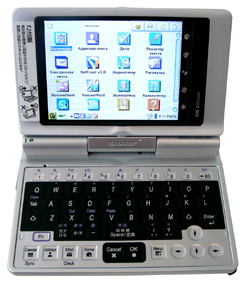 The Sharp Company has decided to do the same as Sony - to make a clamshell pocket computer and "to equip" it with hardware keyboard. But as against Sony, Sharp opens and turns on the wide end face and depending on screen position changes picture orientation on the display. Reorientation passes automatically - the user should only wait. However, the turn function is available and from the program menu, so it is possible turning the screen at any moment. I liked the feeling of integrity in Sharp. All the details are fit very close to each other, everything is in the right place. Sony, in my opinion, looked rather shaky and bulky (NZ-90 model) Sharp, with its big sizes, seems more compact and, for some reason more reliably. It is pleasant to take it in hands and when you turn the screen, there is no feeling that it should fall off now: the rotary loops are hard enough and the screen is fixed in extreme positions with notable clicks. So that an inexperienced would not break the mechanism, there’s even small instruction with pictures sideways. Sharp SL-C700 is more similar to tiny laptop - you expect to see the habitual Windows interface on the screen (forgive me, advanced Linux users and admirers). In the "adult" places there are and expansion slots, and connectors for periphery and cables. Perhaps, it doesn't have only track pad or small mouse for full similarity with laptop. 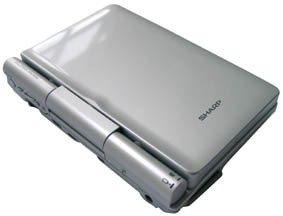 The case of SL-C700 is made of varnished silver plastic, very smooth and pleasant to touch, but it strives slipping out of hands at each opportunity, the handheld computer is rather heavy - 225 grammes. Probably, the decision not to make the case metal was caused, first of all, by the desire not to heavy it. 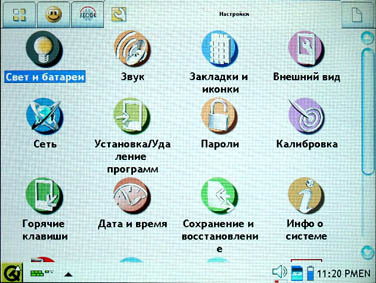 There are a little of buttons except the keyboard: scrolling wheel and dual button "ОК" and "Cancel" - confirmation and cancellation of action, located above the wheel. 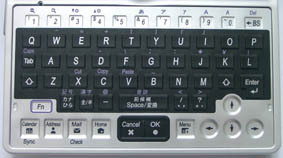 These buttons are necessary to use the handheld computer in non-keyboard mode, when the screen is turned and opened so, that closes the keyboard. Then all this control group locates directly under the big finger, but you can contrive using these buttons when the keyboard is half-opened. Also, the most important button adjoins to the block of managing keys - "Power". Sharp is equipped with two expansion slots: CompactFlash and SD, it's rather fashionably and quite functionally. Among the wireless connection is only IrDa, but having such amount of expansion slots, it can be realized by expansion card. There are two LED's on the case, they notify about new e-mail messages and about battery charge process. 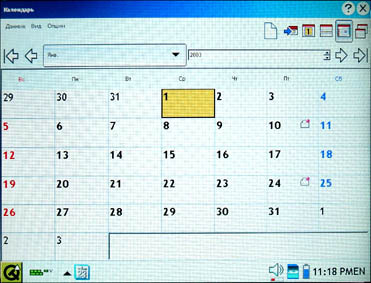 The screen is worth special mentioning, it has the resolution of 640x480 pixels, and its size is 3.7 inches. The screen is excellent, bright and precise, providing readability at any viewing angel. Sharp Company has used for the first time Continuous Grain Silicon (CG-Silicon) technology in it. In the glass is built-in electronic substrate. It provides excellent brightness, but also has some lacks. The matter is that this screen, is the usual active matrix as in the majority of laptops, it is not transflective and cannot reflect sunlight and provide readability in conditions of natural illumination. In result, for example, in the street, you practically see nothing on the screen. The maximal brightness of the display cuts eyes, and normal work is possible only at middle brightness level. Such operating mode also reduce power consumption. 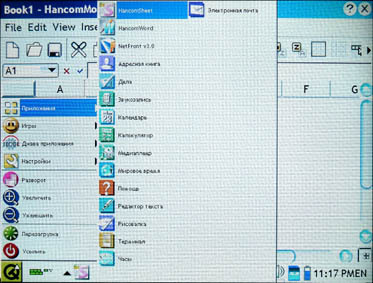 Below or sideways the screen (it depends on way you look) there's also a small panel with touch buttons calling the basic applications or returning user to the applications manager. The icons are slightly turned and are readable both at vertical position of the screen, and at horizontal. Only one thing is inconvenient, these buttons are not highlighted and are lost against a background of the bright screen when there's no enough light. Such screen has one more lack, having such resolution the magnifier should be included in the standard kit. Such resolution is looked well and harmoniously only on screens of greater physical size. Especially from the resolution suffer the fonts, they are very small and you have to screw up your eyes constantly and move them closer to the screen. At that, in domestic or room conditions it's possible to read something, but in the car or other transport when everything jumps, you even shouldn't try reading something on the screen - you won't succeed doing this. 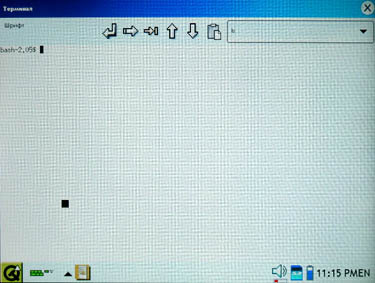 Certainly, the developers of this handheld computer have envisaged hardware image scaling, but it works rather strangely - increases everything, except for fonts, and a lot of programs ignore it. It's very hard reading the fonts, which height hardly exceeds 1 mm. 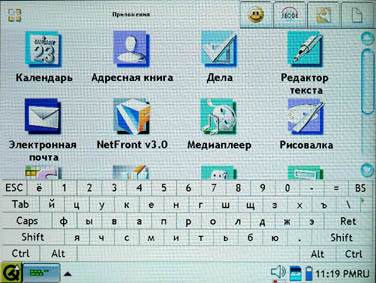 It's possible to download increased English and Japanese fonts in the Internet, but not Russian, and it is a pity, because in particular the resolution can become a serious obstacle on the way of purchasing this handheld computer. The battery is demountable. It is the lithium-ionic battery in capacity of 950 mAh. Such capacity is more or less standard for the majority of pocket computers and should provide rather long operating time.There's no backup battery, but when removing the main battery, the user adjustments are saved, so it is possible to assume, that it is submerged somewhere inside. In principle it is pleasant, that Sharp has taken care of the users, having made the battery demountable, in fact lithium-ionic accumulators do not work more than 2-3 years, it doesn't matter how you use them. Probably, it is considered, that such pocket computer is purchased for rather long period. The battery, behaves really strange. So, for example, the LED can show only one charge stage, and every time you have to check whether the battery is completely charged. If the adapter is inserted into the wall outlet - the bulb lights orange, regardless of the battery condition. Thus if the charge is absolutely slight, the computer, after several shy warnings, simply switches off and doesn't give any signs. To reanimate it can only the power adapter, in this case happens the full OS reloads. The system charge LED is imperfect too, it represents battery's image (full screen) with schematical charge level indication. And that's all - no figures. Only laconic signatures such as: Battery condition - good. It’s very stupid realization. In particular this part of the handheld computer rouses the greatest quantity of censure. On the one hand - Linux - it's good and the main thing it's rather justified from the Sharp's point of view. This operational system is free distributed and the desires of the company: a) to stand out against a background of other manufacturers b) not to pay money for the license, are absolutely clear. On the other hand by the general realization level, the pocket Linux doesn't approach its competitor- Palm and Pocket PC. Such as everything is good, but small lacks spoil all the perception. One of such lacks , as I already have written above, is the absence of magnifier, it's impossible to read something without it, because of tiny fonts, another lack is the general "thoughtfulness" of operational system that, in combination with rather competently developed operational system and serious hardware characteristics is looked rather strange. It is pleasant, that the operational system is Russified now, (completely) it makes Sharp very attractive model for the Russian market. The operational system loads for a long time - about 2 minutes, and it happens during each restart irrespective of "hard» or "soft". 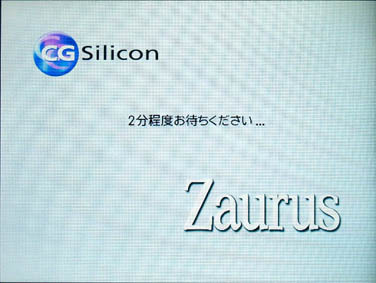 The screen lights milky-white color, Zaurus logo and other inscriptions appear on it, which are intended probably to smooth over the expectation time or at the minimum to inform the user about Zaurus' operations. Alas, all of them are Japanese, therefore at the moment of loading everything, that you can do is to admire the excellent brightness and fantastic clearness of the display. 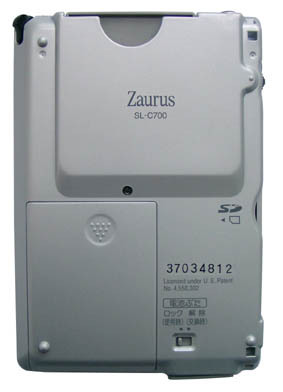 As it should be, Zaurus C700 is completed practically with everything that can be useful to the user for normal work. Standard set: calendar, directory, to do list. All applications are made rather well - beautiful, but without excesses. The menu has only the most necessary functions. Three most important, in developers' opinion, functions are located in the right top corner as icons: create new entry (clean sheet), edit (pencil) and remove (recycle bin). Simple text editor and graphic editor, which can draw only lines and rectangulars, are at your service. Internet - opportunities have pleased. They are realized with the help of NetFront browser and quite advanced e-mail program, which is similar to Outlook - even the icons are similar. 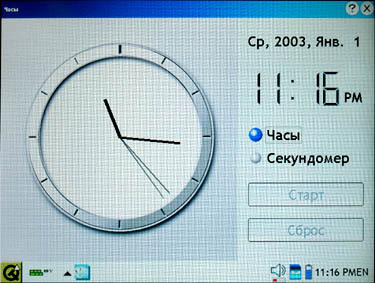 Zaurus has also calculator, sound recording program, clock with stop watch, but for some reason without alarm clock, world time. 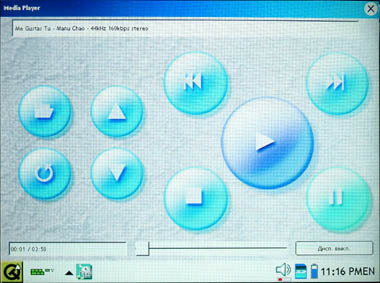 The media player is also present and allows playing both musical and video files. And, that is pleasant, Zaurus searches itself for these files in memory. It has no problems with Mp3, but video freezes. Besides that to open tiny file it required almost 1 minute (! ), during the playing it eats practically the half of information, slipping the frames. Here are also two office applications in the standard set: HancomWord and HancomSheet. Some words are necessary to tell about the interface as a whole. It is very convenient and should not rouse any censure. All is in the right places, quite originally and at the same time you have the feeling that you have already met whit it somewhere. 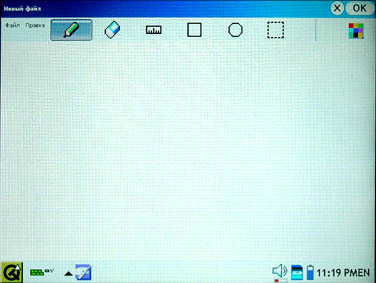 (the unique censure - fonts:-)) In the top part of the screen locate bookmarks of various folders with the applications sorted by thematic, in the bottom part - the control menu, approximately as in Windows. In the right part are displayed as text: time, input language, and as icons are displayed: batteries' condition, sound volume and presence of memory cards in expansion slots, in the middle appear icons of started applications, and in the left corner there is "Start" button, to put it more precisely an analogue, with the logo of Qtopia GUI developers (it's similar to sickle with hammer), by pressing on which popups the main menu. One of the top bookmarks opens control panel, which is rather standard. 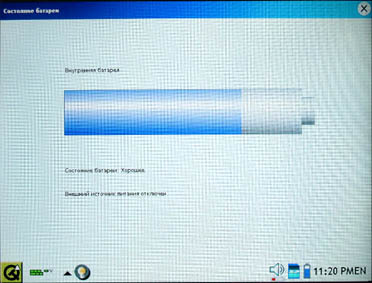 The task manager is also realized as a bookmark in the top menu, and is more similar to Windows Explorer. 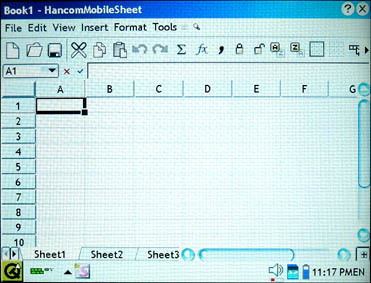 The navigation is realized by folders and icons. If any memory cards are not installed, then at your service is only Sharp's internal memory - icon of pocket computer, if are installed memory cards memory near to picture of handheld computer appear related icons. It is interesting, that to various types of files the operational system automatically gives related icons, for example, if it is a video clip then on the icons is a film roll, if it's a musical file - a note and CD's edge, so it's very difficult to become involved. The unidentified files are shown as white rectangle with bent corner. I'll repeat, practically everything is very convenient and thought over, and if the person has used the handheld computer or desktop PC even once, he won't face difficulties when working with Zaurus. And if this person has professionally used Linux, he will feel quite at home, and assist him in this will the application giving access to a command line. Well, my competence is hardly enough to describe all the opportunities of this tool, I know only the thing, that everything there works much faster, than within the graphic interface. I’d tell, that despite everything Zaurus C700 is very interesting model, but unfinished. To put it more precisely: I have no claims to design - it is excellent (small defects are not counted). From this point of view, Zaurus C700, in my opinion, is that ideal pocket computer which everybody of us waits. But the software has made a mess. The idea is rather good and the realization is normal, but something has not finished and all efforts have come to nothing. So, it is excellent computer for programmers and for those bearded Linux-uncles, about which the people have already started telling stories. And we should wait. Just a little, because Sharp has already stolen up close to the incarnation of ideal. Something fails them - maybe life water or magic wand?